Pearl Izumi has been making a pretty wide range of road and mountain bike shoes for a while now, and the X-Alp Launch sits at the less racy / more trail-oriented end of the spectrum. I’ve spent a good bit of time in the shoe both on and off the bike this spring, and so far I’ve had a pretty good experience with them. Lengthwise, the X-Alp Launch feels true to size. I usually wear a size 43.5, or a US Men’s 9.5 or 10 in a street shoe. I went with the 43.5 in the X-Alp Launch SPD, and it fit nicely. 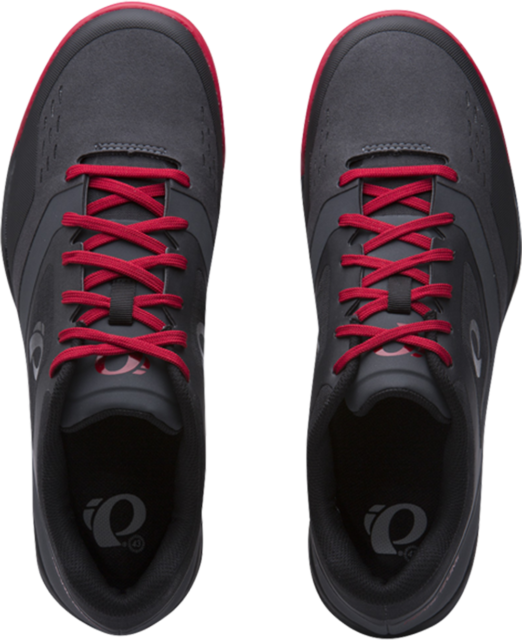 In terms of width, the X-Alp Launch SPD is fairly typical of Pearl Izumi shoes in that it feels pretty average through the heel and midfoot, but has a fairly voluminous toe box. I have a C-width foot, and I liked the fit of the X-Alp Launch around my heel and through the arch, but it felt a little too wide and tall for me in the toe box. People with wider toes / forefoot areas will likely appreciate it though. Arch support on the X-Alp Launch feels average compared to most shoes — there is some arch support there, and it’s neither particularly tall nor particularly flat. The X-Alp Launch SPD’s design puts it somewhere between a skate-style shoe and something a little more hiking-oriented. The X-Alp Launch SPD doesn’t have the overstuffed, extra-padded, somewhat clunky construction that you’ll find on some skate-style shoes. Instead the X-Alp Launch SPD’s material is a bit more conforming, somewhat similar to an average walking shoe (i.e., not quite as burly as a technical trail runner or hiking shoe). But of course, the X-Alp Launch SPD still has a flat sole, and the tread is designed to not interfere with a clipless pedal, so it’s not as knobby as an actual hiking shoe. Inside the X-Alp Launch SPD’s sole is a ¾ shank, which provides stiffness to the shoe in the rear ¾ of the foot, but stops just in front of the cleat to allow the shoe to flex while walking. The end result here is a fairly walkable shoe, and one that’s not totally rigid while pedaling. People looking for a stiff shoe to lay down maximum power or provide a bit more support might be disappointed. But for more leisurely rides, or people who don’t require absolute efficiency, the X-Alp Launch SPD strikes a pretty nice balance. The X-Alp Launch SPD’s Vibram Megagrip sole is… moderately grippy. I’d say it’s about average compared to other shoes in this class that I’ve used, which is just fine. The X-Alp Launch SPD’s sole didn’t interfere with the pedal, and it provided decent traction while scrambling around on rocks. And thus far, the sole is holding up well. The one less obvious feature of the X-Alp Launch SPD is that the cleat pocket is fairly recessed — the cleat sits pretty deep in the shoe. The upside to this is that the cleat doesn’t usually contact the ground while walking, so you get less “clacking.” The downside is that I needed a cleat spacer to get the cleat to properly engage with my pedals (I was using the X-Alp Launch SPD with Time MX6 pedals). One other note — the X-Alp Launch SPD has long, 35 mm slots for the cleats, so it’s easy to position the cleat where you prefer relative to the ball of your foot. Both its styling and construction make the X-Alp Launch a bit more viable as a shoe that’s not terribly out of place off the bike. But the shoe also lacks any kind of ratchet or power strap to help keep the foot really secure in the shoe, especially while pulling up on the pedals. The X-Alp Launch SPD’s good-quality laces do a decent job of keeping my foot cinched down, and a little elastic loop on the tongue helps keep the laces out of the chain. But again, the X-Alp Launch SPD probably isn’t the shoe for people looking for maximum power transfer. I wouldn’t say my foot felt loose in the X-Alp Launch SPD, but the shoe doesn’t have that enveloping snugness that you get with many of the more pedal-oriented shoes. The Pearl Izumi X-Alp Launch SPD is a solid option for those looking for a clipless-compatible shoe that’s not horrendously garish while hanging around at the post-ride bar or burger joint. It doesn’t offer the same protection as some of the burlier skate-style shoes, and it’s not as efficient as some of the more pedal-oriented shoes. But that leaves a pretty large gap in the middle, and the X-Alp Launch fills that space well. So for riders looking for that in-between shoe, the X-Alp Launch SPD is comfy to wear, looks more normal than a lot of other bike shoes, doesn’t sacrifice a ton of pedaling performance, and is put together well.